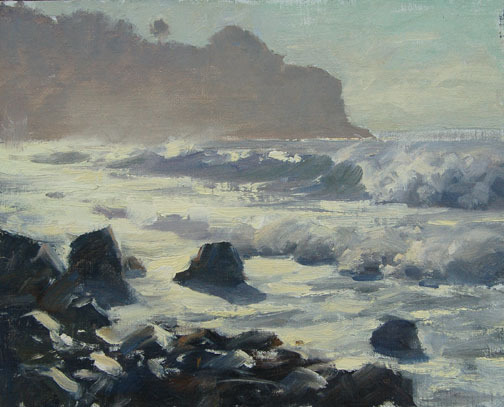 Frank Serrano is a largely self taught landscape and seascape artist, spending his plein air time primarily on the west coast beaches and deserts. 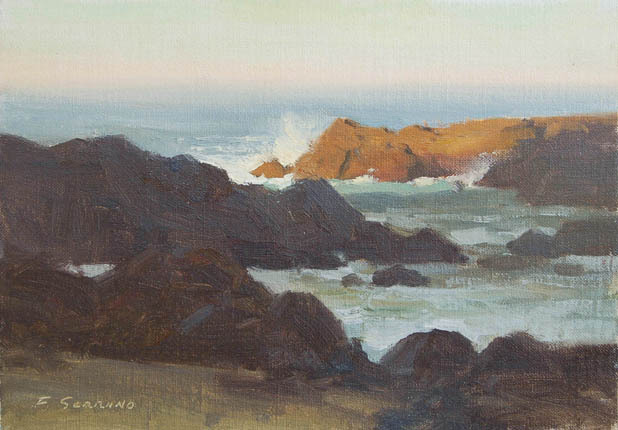 His signature style is retrieving the atmospheric beauty of the landscape and capturing it on canvas. Someone who has always had a paintbrush in hand, Serrano moved from commercial art into traditional oil painting in the early 90s and has since gained an international following for not only his work, but also his workshops. Serrano's own self instruction naturally makes him an understanding and easy to follow instructor, both passionate about the work itself and sharing it with others. I was lucky enough to get to experience his teaching myself a few years back when I worked on a DVD with him in Colorado. Watching him paint was an experience in itself, but his instruction drew me into the work and landscape even more. It is a powerful learning experience to watch another artist "see". 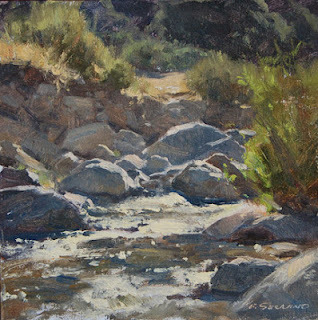 Serrano's belief is that constant painting and painting from life will make a person a better artist. 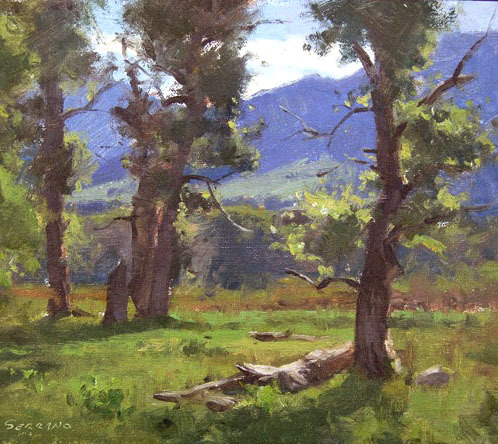 He lives by this, as he is found outdoors most days working on his studies and creating larger pieces in his studio. 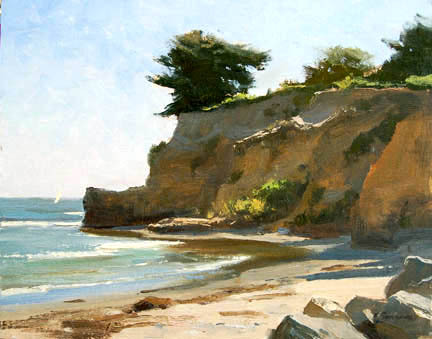 Serrano also acutely observes other artists and learns from their choices how to effectively create better art. In fact, he noticed what other artists chose for their materials early on, whether good or bad. Seeing this, he recommends that artists use the best materials they can afford. For him, that means linen primed panels and high quality paints and brushes. Since Serrano primarily works outdoors, oil paints give him the drying time that works for the weather and heat on the California coast. He chooses his brushes accordingly, finding flat bristle brushes in #4 or #6 to be his primary tools. For very large pieces, he uses house brushes to lay in gesso and block in shapes, since this work is hard on brushes. There is some scrubbing to work the paint into the rough linen, but once the underpainting is complete, Serrano moves on to work with flat bristle brushes and sometimes a sable for detail. As far a special brush technique for Serrano, it all comes back to that constant painting he stresses. "[It] is a feeling when I paint, painting the landscape, everything from the foliage to the rocks has a different approach," he explains. Since he is more of a realist than impressionist, he wants something as close as it can be to how it is formed in nature. Frank has a published book on plein air in oils, Plein Air Painting in Oils, as well two DVDs on painting landscapes, details on his website: pleinairgallery.com. Time to hear from you!